Strong retail sales trends during the holiday season could bode well for the top two U.S. department store chains. The 2017 holiday season was a turning point for many U.S. retailers: particularly department stores. Macy's (NYSE:M), Kohl's (NYSE:KSS), and even J.C. Penney (NYSE:JCP) broke out of long-running sales slumps, posting solid comparable-store sales growth for the November-December holiday period and the fourth quarter as a whole. For Macy's and Kohl's, that momentum continued into 2018. Meanwhile, J.C. Penney's results quickly turned south again. Despite the divergence in their results, all three stocks have tumbled in the past two months, due to investors' concerns about their cautious holiday quarter forecasts. Macy's, Kohl's, and J.C. Penney stock performance. Data by YCharts. However, retail sales appear to have been phenomenally strong during the holiday season. 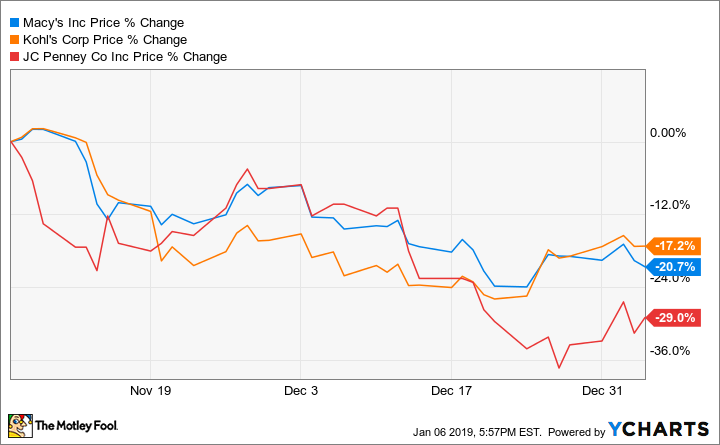 This bodes well for Macy's and Kohl's -- and possibly even J.C. Penney -- all three of which are likely to report their November-December sales results later this week. Through the first three quarters of fiscal 2018, Kohl's and Macy's have both posted solid comp sales gains of 2.1% and 2.7%, respectively. Those figures compare favorably to J.C. Penney's 1.7% comp sales decline during the same period, which was driven by a dreadful performance in the third quarter. Yet investors have found plenty of reasons to fault Macy's and Kohl's, despite their solid sales growth. For one thing, Kohl's hasn't been able to sustain the level of growth it achieved in the holiday quarter a year ago, when comp sales rose 6.3%. Additionally, discounters like Target and many off-price chains have been posting even faster growth, thanks to the strong consumer spending environment. Compounding these worries, Macy's and Kohl's both projected in November that sales growth would slow somewhat this quarter, compared to the first three quarters of fiscal 2018. And J.C. Penney's new CEO indicated that a quick turnaround wasn't likely. Investors have been so concerned about these fourth-quarter forecasts that they seem to have ignored some of the retail sales data that has come out recently. Investors may be misjudging how department stores fared last quarter. Image source: Kohl's. Most notably, the weekly Redbook Index of U.S. retail sales was consistently strong throughout the holiday season. For each of the eight weeks between Nov. 5 and Dec. 30 -- a period that roughly corresponds to the holiday shopping season -- the Redbook index showed a year-over-year gain of at least 6.1%. The highlights included a 7.9% jump the week of Black Friday, a 7.8% increase the week before Christmas, and a 9.3% surge in the last week of December. For comparison, the Redbook Index showed a 5.7% increase in the best week of the 2017 holiday season, and the average gain was just over 4% for those eight weeks as a whole. Additionally, year-over-year gains averaged less than 4% in the first half of 2018. Macy's and Kohl's still managed to post solid sales growth and superb earnings growth during those periods. Even J.C. Penney cashed in during the fourth quarter of fiscal 2017. Bears might point to the U.S. Census Bureau's November retail sales report as a counterexample. This report showed that sales at department stores declined 0.2% year over year in November 2018. However, that still represented a notable improvement compared to the previous several months. Moreover, regional department store operator Bon-Ton Stores went bankrupt and closed all of its stores in 2018, while Sears Holdings has closed about a third of its stores over the past year. Several other department stores have closed a few stores here and there. As a result, if total sales at department stores are down just slightly on a year-over-year basis nationally, comparable-store sales at the remaining department stores must be rising quite a bit. Macy's, Kohl's, and J.C. Penney all posted stronger-than-expected sales during the 2017 holiday season. As a result, they are facing relatively tough year-over-year comparisons this quarter, which may have led their management teams to stay conservative with their forecasts. If Macy's and Kohl's did blow past their sales expectations for the holiday season, there's a good chance they will raise their Q4 earnings forecasts this week -- just as they did at this time a year ago. Considering that Kohl's stock trades for less than 12 times forward earnings and Macy's is even cheaper at eight times forward earnings, news like that could unleash huge rallies for both department store stocks. Check out the latest Macy's and Kohl's earnings call transcripts.